The ancestral Palumbo home is in Ofena, a small Italian village home to 650 people on the side of a mountain. Family roots connect you when you or your family establish in your town, your work and community. In history, establishing roots has been more the norm as people didn’t move around as much as they do today. Travel was more difficult, it took longer to go place to place, and the affluent had the means to travel as compared to ordinary people. It excites me to share my roots with you. I’m sure many of you have similar stories that you have heard from parents or grandparents about family, places and past remembrances. As I’ve been told only from my parents because both my grandmothers had passed away by the time I was born and my grandfathers didn’t speak English. In 1904 there was a great migration from Italy. All my grandparents came to America during the great Italian diaspora. Interesting enough, my mother’s Italian family, Palumbo, and many relatives lived in a small 14th century mountain village in Ofena, about two hours east of Rome. Like most immigrants from Europe, they arrived in New York as one port of call, Ellis Island. An estimated five million Italians left Italy hoping for a better life during this diaspora. It wasn’t until my first cousin, Jimmy Palumbo from Virginia, went back to seek our family roots that we found out the Palumbo village home that was left by my grandparents in 1904 was still there in Ofena. But it was unlivable, with only walls standing. Jimmy reached out to 21 Palumbo cousins and asked for partnerships to restore the Palumbo ancestral home. I was one of four cousins who agreed to partner. The restoration process began in the small village of Ofena. The project was completed five years later, and the Palumbo family now enjoys the wonderful work. In 2002, I visited the village and grandparents’ home, and returned in 2013 to see the restoration work that was done. I was the last of the four cousins to visit the home as all the cousins lived on the East Coast. With me being halfway around the world, and at that time working on a weekly community newspaper on Kaua‘i, I found little time to travel. I would need to spend at least three weeks over and back. The reason I was moved to be a part of rebuilding the ancestral house in Italy, is I wanted my children to be connected to their roots. Being able to know where their ancestors came from, their stories of struggle, is an important part of appreciating the way we live today. Yes, my grandparents were Italian immigrants, never spoke English and raised 14 children in the “land of plenty.” Like most immigrants, they worked hard, grew their own food and made sure their children where educated so they would be able to work in the factories outside of Boston or get teaching jobs. Does this story sound familiar to you? The only difference is the influx here in Hawai‘i is concentrated mostly from Japan, China, the Phillipines and Portugal, to name a few countries. Most immigrant families experienced the same challenges of settling in America; language, education, vocations and just downright survival, day-to-day survival. They bring with them their cultural foods, holidays, songs and dances. If you have a story you would like to share about your roots, heritage, your special place, I would love to read about it. 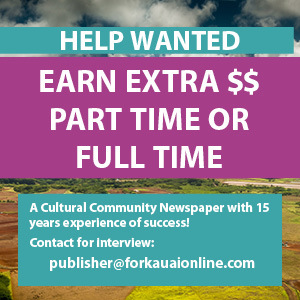 You are welcome to send your story to editor@forkauaionline.com.